January 14 – Departed for Mt. Kilimanjaro and arrived safely, capping off the arrival with local beverages under the African moonlight. January 15 – The weather was warm and humid. All in good spirits – anxious and excited! January 16 – Arrived at first camp site after climbing for 5.5 hours and reaching 3000 meters. Although the climb was a bit taxing physically, spirits remain high. January 17 – Arrived at the second camp site – the Shira Plateau. It was an awesome day for all… no longer in the tropical jungle. Feeling strong. Everything is so clear and so congruent. Today we conquered the Lava Tower and tomorrow the Borronco Wall! The weather is getting colder, complete with rain and hail, it’s the descending that’s doing me in. With the Slow Marching Band of Jethro Tull in my head everything is pole, pole (meaning slowly, slowly). 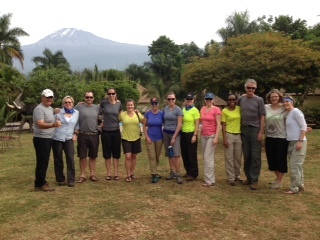 Here is the group before the journey up Mt. Kilimanjaro.